Some people can sing and play the piano. Others can write and play sports. But artist D. Westry can paint, and he can paint fast. Westry took to the stage during the segment "Anderson's Viewers Got Talent," competition on the show "Anderson Live." While Westry works on his masterpiece, you can't help but wonder what he is creating. 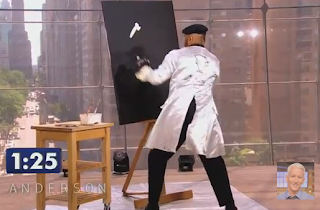 He also claimed he could create a large painting in less than one minute and thirty seconds. But, once he adds his final touch and time starts dwindling, you will be amazed at this man's creativity and talent.